It's an allegory of plain and suffering, love and loss, mercy and triumph. It started as a novel and is now a Broadway hit. But you don't have to go to New York to see this award-winning show because it's coming to Erie. It's an allegory of pain and suffering, love and loss, mercy and triumph. And within its bindings lives a mosaic of women who struggle to resist oppression in a racial world; who learn to survive in an environment that continually vanquishes them; and who are truly authentic in the ever-duplicitous society. The tale is gut-wrenching, tear-jerking, uplifting, and ceremonious, and within its very essence exists two sisters and their unending loyalty to each other – loyalty that spans decades, distance, and years of silence. 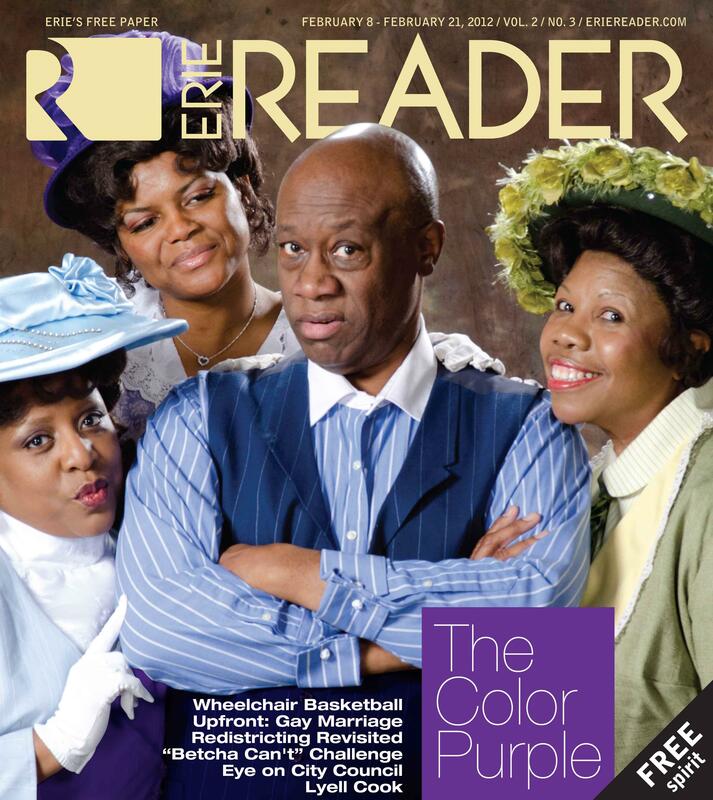 That story is, "The Color Purple." This Alice Walker work has been adapted to film and produced on Broadway, and now it can call the Erie Playhouse home. In fact, the Playhouse is only one of 20 community theaters in the United States granted first rights and privileges to stage such a magnanimous performance. And it opens Friday, Feb. 10. To provide you with a brief synopsis, the story is about an African-American woman, Celie, living in rural Georgia. It encapsulates her years as an abused daughter and then wife; as a sister, a mother, and friend. Throughout the course of her life, she is surrounded by a series of women who ultimately help shape her. There's Nettie, her sister, who becomes a missionary teacher in Africa; Shug Avery, a Blues singer that Celie's husband Albert Mister is in love with; and Sofia, the strong-willed daughter-in-law whose strength and courage inspire Celie. And although she suffers immensely at the hands of these abusers throughout the story, she is the core of this very community of women and ultimately the one who knows how to survive. "There are 30 African-American actors in the cast," Almi Clerkin, the director of the production and the Playhouse tells me over a cup of coffee. We met up at Panera on one of the few bitterly cold and snowy days Erie's had this winter. It was right before noon, so it might have not been the most ideal setting for a one-on-one interview, but the coffee—and ultimately soup—was just what I needed that day. As soon as she sits down, I can tell she is struggling with a cold, but she's as animated as ever, and lights up as she starts talking about the production. "The piece is so cultural and beautiful—I'm continually moved by the performance and storyline," she begins. "In the script, Alice Walker wrote several paragraphs instructing the actors to be true to the language she's provided—the script and dialogue is written in a way that we as actors must be faithful to. It's important to the time and the culture – and of course we respect that." To prepare a bit for the conversations I would have with Almi and other individuals involved, I read the book and watched the movie again. Both works are amazing in their intensity. The book is an epistolary novel, each page either a letter to God, or to or from her sister Nettie. The work spans decades, from the 1920s to the 1950s – the characters age, the styles change, and over the years, they go through major emotional, mental, and physical changes. In the film, the music is stylistically varied, showcasing jazz, ragtime, gospel, African music, and the Blues. Having this little bit of background, I can only imagine the time commitment to put on such a production. "It is a demanding schedule," Almi tells me, "We have 35 to 40 rehearsals, and that's a lot seeing as the average rehearsal schedule is maybe 25 at best." She emphasizes, "These actors are volunteers. They have families, jobs, and other commitments. Rehearsals alone span four to five hours and they need to memorize their lines long before they even show up." And knowing how much they're already committed, she adds, "On top of that, I will get to rehearsal and our choreographer will already have a handful of folks going over their dance scenes. Or I'll say rehearsal is over at nine and some will stay and keep going over their lines – the commitment to the piece is amazing. I've honestly never seen anything like it." I then ask what I think is one of the most pertinent question to a non-profit arts organization: how much does a production like this cost? Almi looks at me and after a deep breath, says, "I wish I could express how important these ticket sales are. People don't realize how far their money goes. Before we can even start the production, we have to pay the royalties." I quickly learn that just to get the rights to stage the 11 performances they will conduct, they pay upwards of $12,000. "And for a show this size," she adds, "the costume budget alone is close to $10,000. You have to remember, we're covering 30 to 40 years – styles change. Our 30 actors go through two to three costume changes throughout the production. In total, it will probably cost us upwards of $45,000. Then we have to bring that much in to just cover the costs." Unfortunately, perception is reality for many of us. Many individuals look at community theaters as low on the totem pole; in fact, high schools often get production rights long before community theaters do. "But we're not just a community theatre," Almi tells me. "From the talent on the stage, to the creativity and workmanship in the sets and lighting, to the intricate details in the costuming – and all of this is done locally at the playhouse – it's more than that. I hear, and mostly from individuals that have moved away, that people just can't believe the talent that exists here – but when you've seen our work, you know – and then you understand it truly is far more demanding in both time and talent." Local actor Hayes Moses plays Harpo in the production. Harpo is the son of Mister, the abusive husband of the main character, Celie. In the story you're introduced to young Harpo. You watch as he grows up and ultimately marries the independent and outspoken Sofia, played by Sharon Newell. As an adult, his character struggles with treating women as his father treats them rather then as they should be treated. "This is my 25th year at the Playhouse, and my eighth production overall," Hayes mentions proudly on the phone. "My character is somewhat of the new-age man if you will – for that time period anyhow. He struggles with pleasing his father and he meets Sophia who won't put up with any of it. She's grappling with his love for her and what he's been taught growing up. It's an interesting character, and I love having the opportunity to portray him." As he's telling me about his role, I recall my previous conversation with Almi and I mention to him that just the other day she was singing his praises (what I don't say is that she also told me he and Sophia have such great chemistry in the production - that they get a bit frisky in one scene - but their interaction is quite charming). "Almi is wonderful," he adds. "And the Playhouse has been very special to me. I wasn't good at sports." He laughs. "And they let me exercise the gifts and talents that God gave me. I had two saving graces growing up – my church and the Playhouse. I've gone through some difficult times as of late in my life and going back to the playhouse is like going back to what's familiar – it's home to me. When the opportunity came up to be in this production, I thought I just have to do this. We don't have a huge African American population, and the Playhouse has made a concerted effort in the last several years to produce shows that are predominantly minority cast. And that in itself is just incredible to me. I love being part of this group." Lyn Twillie-Darby plays Doris, one of the three church ladies. These women were not part of the book or the movie, but they were added for comic relief and to help move the story along. Both Lyn's husband and daughter have been part of the playhouse and they both encouraged her to get involved in this production. I spoke with her in between appointments one afternoon. "I was in my first and only performance back in 1992," she tells me on the phone, "however, I haven't been in anything since then. So, since it's been 20 years, I'm looking at this as my big debut," she says laughing." I ask her how she feels about that. "I'm excited, but also a bit nervous. It's been a long time, and now I'm front and center and that can be a bit unnerving. However, what's been most interesting for me is the role has given me an opportunity to stretch my own talents. Singing has never been difficult for me – but dance and movement is, so the choreography has been challenging. It's been the most enriching experience though. I've also had the opportunity to meet so many new people, and although I've known Almi for a number of years, I've gotten to see her in a different light. She gets emotional in certain parts of the show and it's great that she gets so into it. It just shows me she's a woman with compassion." I can personally attest to this. When Almi and I met a few days before, she told me about staging the final scene—I won't give it away in case your unfamiliar with the story. As she was telling me this, she herself starts tearing up, "It's just so beautiful," she tells me, choking back tears. "See, I can't even talk about it without crying." Knowing the impact this work has had on society as a whole, I set out to see if I could connect with some of the individuals involved on the national level. Of course I reached high and tried to connect to Alice Walker herself, but to no avail. However, as luck would have it, of the phone calls and emails I sent out, I was rewarded with positive responses from two of lead composers and lyricists involved – Allee Willis and Brenda Russell. Both happily agreed to speak with me – and were more than excited to hear that Erie was one of the few community theatres staging the production. Allee Willis is a Grammy, Emmy, and Tony Award-winning songwriter and artist. Her work has sold over 50 million records and she has written several '80s hummables, many I'm sure you know, such as: "September," "Boogie Wonderland," "Neutron Dance," and "What Have I Done To Deserve This." She also wrote The Rembrandts' "I'll Be There For You" (the theme from "Friends"), the song that was played so often on the radio during their final season, I couldn't wait for them to not be there for me any longer. I called Allee in her L.A. home from my office. After the first ring, she picks up - I incorrectly pronounce her name twice - and of course she corrects me – but I quickly learn what a savvy, creative and energetic spirit she is– someone completely unabashed that has clearly gone through life asking for exactly what she wants. Although Allee is a singer-songwriter, she doesn't know how to read music. "However, I got a job right out of college at Columbia Records. I was writing all the radio and print ads for women and African-American groups (they were categorized collectively under a minority grouping)." I learn her first album came out on Epic in the mid-1970s – but that it didn't make a lot of noise. "Shortly after, I was dropped from the label." Although disappointed, she quickly learned greater forces were at work. "I came to find out that although the album didn't sell, one person had loved it: singer Bonnie Raitt. So, the day I was dropped, a friend took – well dragged – me to a recording session." But as luck would have it, as soon as she walked in, there was Bonnie Raitt in the flesh. "She was singing my praises. There I was, completely depressed, and the only woman that I knew bought my album was standing right in front of me." Bonnie would help Allee kick start her career back up, and although Allee thought things would start happening quickly, they didn't. "In 1978, things changed," she says. "Patti Labelle heard some of my songs and flew me up to San Francisco to create some demos. She became the first artist to regularly record my stuff. After that, things started to quickly evolve, however, I get bored quickly. I was ultimately doing the same stuff over and over. I wanted to be more than just a songwriter." And this is how "The Color Purple" came to be. "The producer, Scott Sanders, was a really good friend of mine. He took me to dinner one night back in 1998 and told me he bought the rights to the piece," she says. "I thought immediately he was going to ask me to write it. He didn't though and instead asked me who I thought would be best." Although Allee wasn't crazy about the names he gave her, she recommended one based on what he was looking for. "The person I recommended ultimately got the gig, but things didn't work out and a year later Sanders called me up again. I thought for sure this time he was going to ask me – and he still didn't!" she exclaims to me. "He bounced about 50 songwriters off of me, and I didn't like any until he got to the name Brenda Russell, which, let me tell you, was towards the end of that list. So, I said, 'look, Brenda is actually about to come over. What if she and I write something together?' So, he told me I could submit a demo but not to expect any favors." And they didn't expect any, but obviously, they got the gig. It was something that would ultimately take Allee, Brenda, and Stephen Bray close to five years to produce. "We spent every single waking day writing to get to the final product. Although we opened in Atlanta in 2004, we re-wrote much of the show between the regional opening and Broadway." I learn this is actually common practice. "It was an incredible rollercoaster. By the end you're collaborating with hundreds. It was one of most complex and rewarding things I've ever done." Brenda Russell is a Grammy-nominated singer-songwriter and keyboardist. Her talents have been used by the likes of Stevie Wonder, Aretha Franklin, Joni Mitchell, Donna Summer, and Sting. In addition, she wrote the score for the film "How Stella Got Her Groove Back" and appeared in the 1999 film "Liberty Heights," in which she performed two songs written especially for the movie. Brenda was quite the opposite of Allee on the phone. Although both of them are glaringly talented, they come across as completely different personalities. Allee's vivacious and bubbly voice hangs in contrast to Brenda's soft and insightful tone, setting up a perfect yin and yang – two individuals that are interconnected and interdependent in the natural world but yet give rise to each other in turn as friends and professionals. One of the things I had intended on asking Allee was if she had the chance to meet Alice Walker. But since I didn't get the chance to, I decide to open my conversation with Brenda on that very subject. "Oh, that was one of the highlights of this entire experience!" she exclaims on the phone. We actually met her right at the beginning before we wrote anything. We all went to dinner together and I remember shortly into the discussion, Allee leaned over to Alice and quipped, 'I want you to know - it's an all white version.'" Brenda laughs for a moment and goes on, "Alice looked at us for a second, not knowing how to react, and Steven Bray, then chimes in 'oh, and it takes place in Stockholm, Sweden.'" I laughed imagining Alice's reaction to this motley crew. Although, moreover, the three of them really just wanted to honor her, so they asked her what she hoped to achieve that wasn't able to be produced in the movie. "She told us there was some controversy on the portrayal of men in the film. The movie didn't enhance that anxiety and depression the men were experiencing at the time. And although the piece is fictional, it has underlying truth. It wasn't so long ago blacks were slaves and treated as second-class citizens. So we showcase more sensitivity in the musical." Working together, these individuals had to stretch their own stylistic talents and knowledge. This was something new to them – to write a musical - but allowed them the opportunity to think more broadly. And through this they found breaking the rules of songwriting to be quite liberating. "We worked very collaboratively. My strength is sitting at the piano and coming up with musical and lyrical ideas. Allee has killer melodies and visual ideas. It's one of the most premier writing teams I've collaborated with in my life. Our songs had to push the storyline. We would read a scene from the book to each other out loud and watch a scene in the movie and then I would sit down and start playing. We would ultimately find the niche, Allee would exclaim, "that's it," and I would say, "it can't be; we haven't killed ourselves yet." Throughout the entire work, Alice walker was constantly telling Brenda to talk to her ancestors – they will tell you what to write. "She was so spiritual. She would literally write things back to me that I wanted to frame and put on a wall. We were all very inspired by and true to her words." Hearing this, I recall my previous conversation with Almi about keeping true to the language of the piece. Throughout the entire evolution of "The Color Purple," there remained a continual connection to all those involved—on the national scale to the local production—which is what I think Alice Walker would want. And she says it clearly in her own words, "No one is exempt from the possibility of a conscious connection to All That Is. I see and hear you clearly, Great Mystery, now that I expect to see and hear you everywhere I am, which is the right place." Remember, the Playhouse is only one of a select few across the nation that were granted first rights and privileges. It is you—theater lovers and aficionados, supporters and friends—that help cultivate this talent. And that continual connection amongst all of you, led us here…right now…the right place. This is definitely one performance you're not going to want to miss. The production opens this Friday, Feb. 10 and run through Sunday, Feb. 26. For tickets and show times, call 454.2852.